If you have a blog, you should offer visitors a way to subscribe to new posts via e-mail. This means they can receive new posts via e-mail without having to visit your blog. You should offer this whether your blog is frequently updated or rarely updated—but especially if it’s rarely updated. Why? It’s a good and valuable service to provide for readers who don’t want to miss your posts. It’s a free service you can provide. You’re keeping ahold of readers in a more personal way. A high number of e-mail subscribers can be just as important and impressive as your monthly visits—plus it shows a dedicated and involved readership. 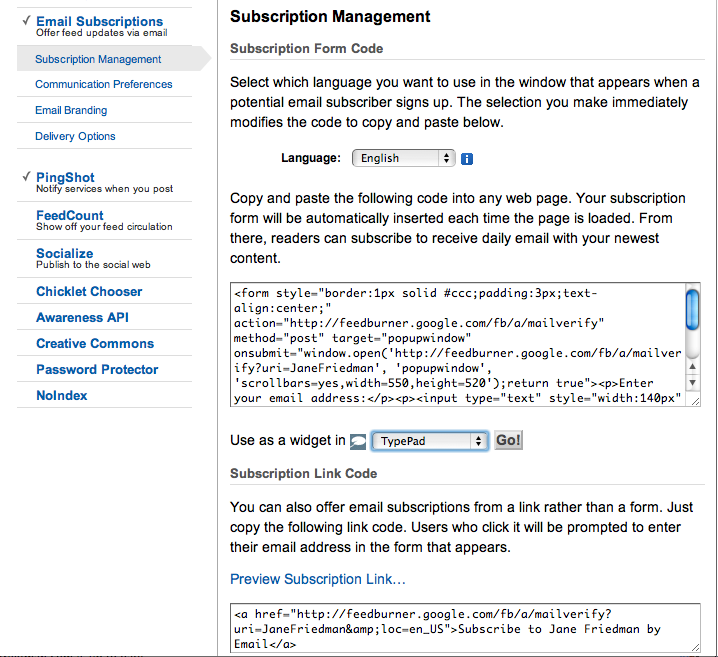 Implementing an e-mail subscription form or widget is easy if you use a popular blogging service. It’s a little more complicated if you host your own site, but still easy. Here’s how to do it. 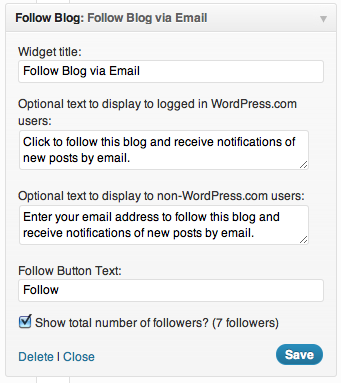 Go to the “widgets” area of your WordPress.com dashboard and look for the “Follow Blog Via Email” widget (shown above). Customize it and add the widget to your sidebars, footers, or wherever else you think it makes sense to display it on your site. I recommend you display it alongside every individual blog post. 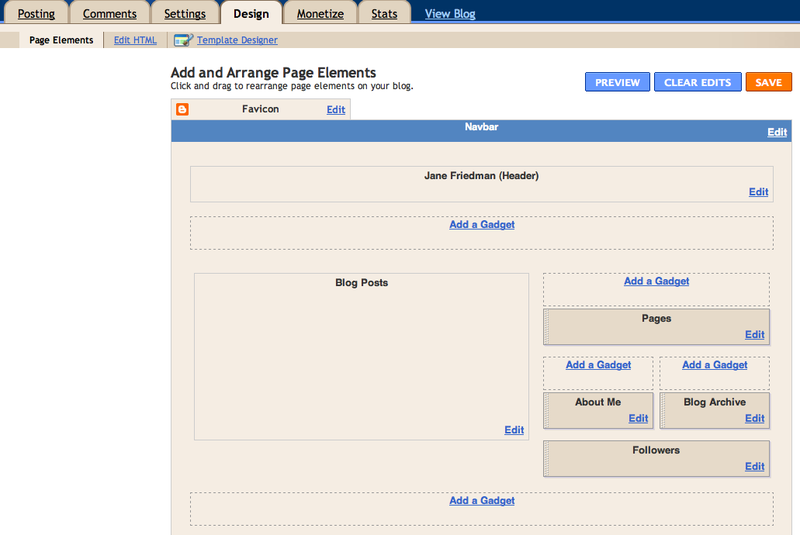 Go the “Design” tab, where you can add and arrange your page elements. You want to “add a gadget,” and look for the “Follow by email” option. Blogger will automatically set up a Feedburner account for you to handle the e-mail subscription service (which is awesome). If you’re running a self-hosted WordPress site, your WordPress theme may have a specific place for you to input Feedburner information as part of the design and setup. If not, and you’re unsure how to integrate Feedburner, read these helpful instructions. Go to your Publicize tab, click on “E-mail Subscriptions,” then look for Subscription Form Code and Subscription Link Code. For my site, I use only a subscription link (look to my righthand sidebar, on the right). Once you’ve publicized the form or link to subscribe via e-mail, you’re done. Then you get to watch people sign up! Feedburner offers analytics on how things are going. If using Feedburner, customize the subject line. I recommend each e-mail show your new blog post title, not just your site name. This option is under Publicize > E-mail Subscriptions > E-mail Branding. Here’s the code you can copy and paste. Just use your site name, not my name! 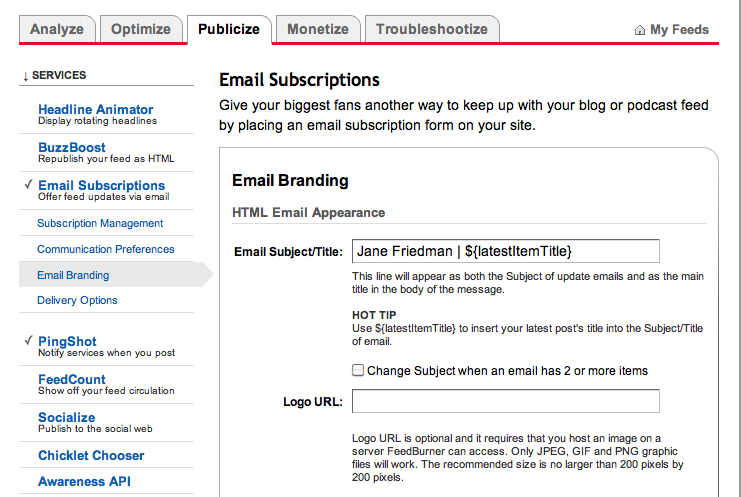 There are many other ways you can customize the e-mails sent from Feedburner. Unfortunately, the Feedburner system isn’t the most intuitive or easy to use. The persistent, however, are rewarded. For more step-by-step information on setting up Feedburner and customizing it, here’s a helpful series from Eli Rose. Do you have tips for using Feedburner? Or overall tips for e-mail subscriptions? I hope you’ll share in the comments. Posted in Digital Media and tagged blogging, email subscriptions, Feedburner. Yes! It does. Good point. Very much appreciate you leaving the tip & insight! i just love you @janefriedman:disqus You work so hard to remind us about the obvious! thank you ! Aww, thanks! Always happy to help. Are you able to read minds? Top of my list today in the process of getting my new blog up and running is to get a Feedburner account, and to get the subscription process working. Thank you for this excellent (and eerily timely) assistance! Yeah. Me too! Thanks Beth. Thanks Jane. I’m just getting re-started. Great info, Jane. I learned something about Feedburner, thanks! Automatic recently released the Jetpack plug-in for self-hosted WordPress installations. It offers most of the extras you get from hosting through WordPress, including easy email subscriptions. Oooh! Excellent tip. Thank you for mentioning that plug-in. It’s a fabulous addition. I use Feedburner and like it. It has a clean look and is easy to use. Awesome!! Thank you so much for that!!!! 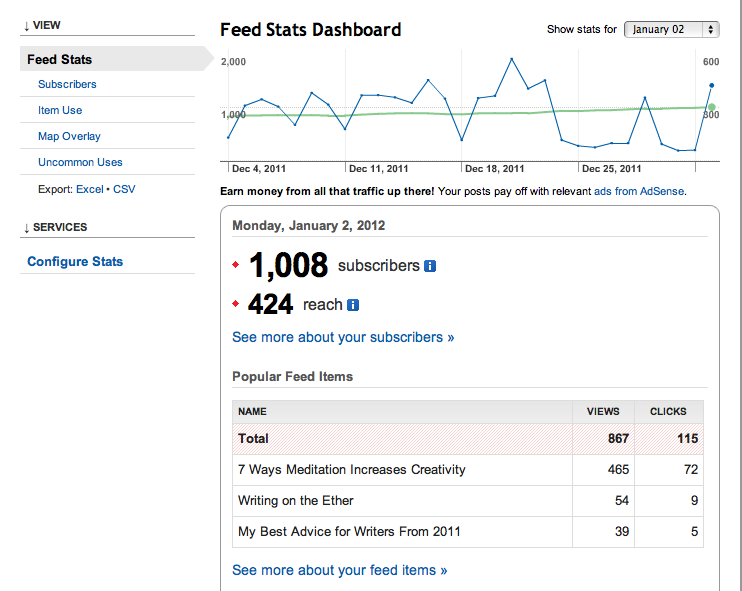 Hopefully this will encourage more people to read my blog! Oh no! Yes, you might consider a platform switch. I believe it’s rumored that Apple won’t support or develop iWeb in the future. Jane, thanks a lot—I hadn’t see the code on how to have your post title, not merely your blog name, appear in the mail’s subject line. An easy fix, thanks to you. I use blogger and I’d actually set this up before but didn’t realize it. Now I actually know how to use it 🙂 Thanks! YES YES, a thousand times YES. As part of my declutter life campaign I got rid of my feed reader because I had too many blogs and not enough time. There have been other blogs that I wanted to subscribe to but there was no email option and…guess what. I didn’t subscribe and now I’ve forgotten them. This is so important. I’ve been wondering if this is a feature I should add to my blog. Thanks for the post, advice and instructions! Appreciate you reading & commenting! Great post Jane, I had already set this up on my blog but you made it very clear why it’s such a good idea. I did it because I like getting blogs by email. Nice! Thanks… I’ll be working on this next up. Any time you want to float down the Grand Canyon or Middle Fork of the Salmon and do a daily tweet about your experiences to all your fans, let me know! Thank you for the information about feedburner. I was not aware of it until now. All of this is still very new to me and I appreciate the information you are sharing here. Thank you – that was an extremely helpful tip. Thanks for helping me out! My brother just asked me how he can email to my blog…technically challenged as I am found you! Thanks Jane. Yes, old post but just found it. Thank you! I am chinese, before i use qq list to collect subscribers. It can support 50k subscribers and free. But it is in chinese so can not support my another website which is English. I search this Email subscription service for one month and now i find it . Thank you!! But because Google just stop service for Google Reader. So do you think Google will Stop service for feedburner maybe one year latter. What can i do if it happens? Indeed. I recommend going to MailChimp or Campaign Monitor if Feedburner should close—but they’re not free beyond 2,000 names. I don’t know of any competing service—something like Feedburner—that IS free. I found your blog by accident, and it’s a serendipity. I need help with both writing and setting up my blog. My blog is on WordPress. org and is hosted by HostGator. My immediate problem is adding the ‘follow blog via email’ widget, as described above, in the 2012 Theme. There isn’t one. Can one be added? Or do I have to change theme’s, which I believe will be a lot of work. Thanks for being here. “Follow blog via e-mail” is a WordPress.com widget that isn’t immediately available to self-hosted WordPress users (regardless of theme). However, you can add that functionality back if you install the Jetpack plug-in. I’m super confused by subscriptions, from a blogger’s point of view (vs subscriber). Is there a reason I’d want both RSS (linked like a social icon, for instance) AND a custom newsletter?? I personally hate RSS feeds and don’t use them myself, so I haven’t even tried to put one on my blog. But I love custom newsletters, so I’m finally preparing to implement one, and am pretty sure I’m going to use MailChimp. Thoughts? Advice? Thanks! RSS is very different from an e-mail newsletter. Your blog probably has an RSS feed without you even doing anything, especially if it’s WordPress or Blogger based. MailChimp is an excellent solution for a custom email newsletter, and can also be used to for email sends of RSS feeds. If that sounds confusing, then I recommend reading up on it at MailChimp. Thanks! So do I need both? If you’re blogging, the RSS-based e-mail newsletter is an excellent way to get started with e-mail newsletters since it’s automated. For the long term, I recommend both.